an obligation or a security of a government or bank. any person acting under a contract or licence from the Bank of Canada or Royal Canadian Mounted Police (RCMP). A person who contravenes subsection (1) is guilty of an offence punishable on summary conviction. the likeness of the bank note appears on only one side of the likeness. 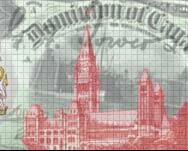 Each of the banknotes depicted on this website are reduced to 74% of their original size and are in an electronic format and therefore comply with Section 457 of the Criminal Code of Canada. If the viewer of these images chooses to print them, it is the responsibility of the viewer to ensure that the viewer is in compliance with any applicable law, regulation or statute. The Bank of Canada banknote images depicted on this website are used with permission from the Bank of Canada. Further uses beyond this website may be an infringement on the Bank of Canada's copyright and may expose you to legal actions.